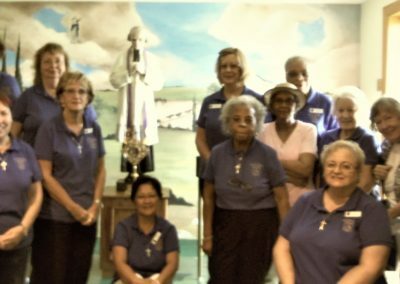 On September 21, the Ladies of Charity of Holy Ghost parish made a spiritual pilgrimage in celebration of the 400th Anniversary to three of the earliest Catholic places of worship in the United States. The pilgrimage began with Mass and rosary at Holy Ghost, which too has a share in Southern Maryland History. 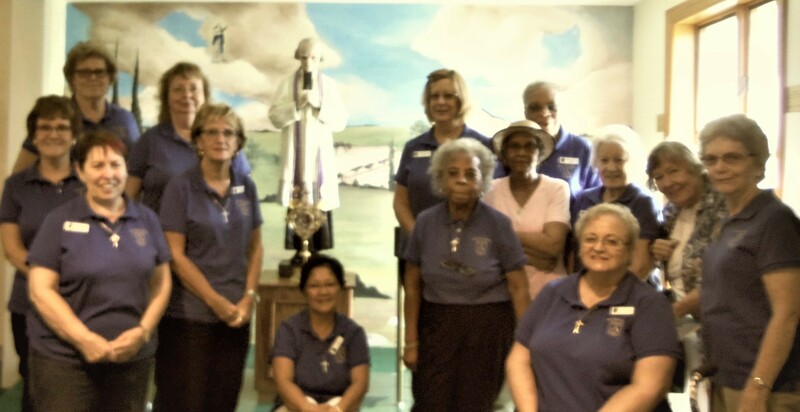 The Ladies journeyed to St. John Vianney’s Shrine at St. Mary’s Church, Newport, St. Ignatius Church & Thomas Manor House Chapel Point and the Carmelite monastery in LaPlata, all in Southern Maryland. Faith, hope, love and endurance are the spiritual gifts of the early Maryland Catholics who arrived from England in 1634. Maryland was founded by Catholics as a place to freely practice their religion. At the time Catholics were persecuted in England. From the beginning, the colony was open to other religions and included Quakers on the first voyage. Father Andrew White, an English Jesuit, accompanied the settlers on the first voyage. It was Father White who built the first church at the Chapel Point location in 1641, a humble makeshift chapel, on a point where the Port Tobacco River meets the Potomac River. The Jesuits considered Maryland mission territory and sought to evangelize the native Americans while also serving the colonists. 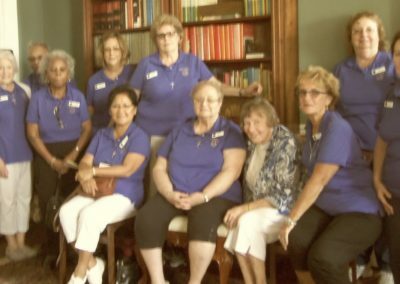 With a history briefing given on each location, the Ladies learned of the difficulties of maintaining freedom of religion in a colony founded for that purpose. After troubled years in the late 1600s caused by political strife in England, in 1704 the Maryland Assembly passed the Act to Prevent the Growth of Popery. From that time until 1774 Mass could only be celebrated in private homes. There were no Catholic schools and persons wishing to enter religious life did so in Europe. Both of the churches the ladies visited were closed during that period but the Catholic communities endured and the churches later reopened. The Carmelite community was established in Port Tobacco in 1790 shortly after the Bill of Rights established freedom of religion in the new United States. The founding nuns were Maryland natives who had entered the convent in Belgium. When the new monastery opened, many young women from this area were waiting to enter. The Carmelites provide a place for prayer, spiritual rest and silence. The Ladies enjoyed box lunches in the extensive gardens. 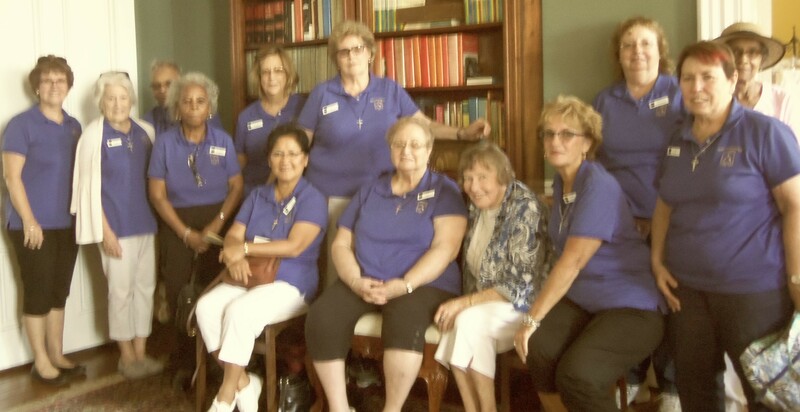 The Ladies learned at both St. Ignatius Church and St. Mary’s in Newport how devout communities of Maryland Catholics endured during the dark days of the 1700s and flourished in the young United States. Their parishes became part of the diocese of Baltimore, seat of the first Bishop in the United States. A sign of the devotion of Maryland Catholics over the years was the establishment of the first shrine to St. John Vianney in the United States at St. Mary’s Newport in 1931, just six years after the humble patron of parish priests was canonized in 1925. People traveled great distances to pray and attend novenas at the shrine. On a beautiful fall day the Ladies felt solace and encouragement making this fall pilgrimage through learning more about the steadfast faith of those who preceded them in the early days of Southern Maryland.